WHO and CDC recommend that individuals who are potentially infected with Ebola virus should be quarantined for 21 days. Where does this number come from? Charles Haas at Drexel University asked the same question, and provides an answer. The quarantine period for an infectious disease is based on the incubation period, the time before symptoms of an infection appear. For Ebola virus, the incubation period is 2-21 days after infection. During this time it is believed that individuals infected with the virus are not contagious, but they could produce small amounts of virus. Whether or not a patient is contagious during the incubation period depends on the virus. It is clearly important to determine the correct quarantine period for Ebola virus to prevent chains of infection. The longer the quarantine period imposed, the less risk of infecting others. 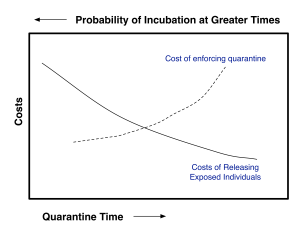 However the cost of enforcing quarantine must be balanced with the cost of releasing exposed individuals (illustrated). According to Haas, the optimal quarantine time should be at the intersection of the two curves. To determine how the Ebola virus quarantine period was set at 21 days, Haas examined the incubation periods calculated for previous outbreaks. In a study of the 1976 Zaire outbreak, the mean time between exposure and disease for 109 cases of person-to-person spread was calculated at 6.3 days with a range of 1 to 21 days. Mean incubation times for the 1995 Congo outbreak (315 cases) and the 2000 Uganda outbreak (425 cases) were 5.3 and 3.35 days, respectively. Two other analyses of the 1995 Congo outbreak gave mean incubation times of 10.11 and 12.7 days. WHO has estimated a mean incubation period for the first 9 months of the current west African outbreak as 11.4 days, with an upper limit (95% confidence) of 21 days. Haas concludes that the 21 day quarantine value is derived from a ‘reasonable interpretation’ of outbreak data, but it might not be long enough. He estimates that there is a risk of between 0.2% and 12% of developing Ebola virus infection after 21 days. The current outbreak should allow collection of data for revising and updating the 21 day quarantine period for Ebola virus infection. I’d really like to see the methods and calculations behind the last statement that there may be a “a risk of between 0.2% and 12% of developing Ebola virus infection after 21 days.” Is the premise here that the 95% CI is not enough–that we need to account for 97.5% or all outliers? As a physician and public health official in LA your analysis has important implications to me. This kind of blog post begs the same level of transparency of methods as a good journal article if we are to take it seriously. We don’t know anything about CI at this point. The stats are from a previous outbreak, nothing is known about the current outbreak. I linked to the article, read it and find out the methods. Seems like the Ebola situation is getting worse worldwide – Let everybody know – Only I on Earth got the cure and prevention of Ebola and any other viruses, cancers, diabetes and strokes – To disclose my magic Virus/Cancer Destroyer (just an exercise for a minute a day) and rid the world of any diseases, I gotta be paid 50 billion EURO – in any case becoming equals to Gods – never getting sick of any diseases even for a second, has its price, doesn’t it? Would the author direct me to the place on the WHO site that says those who are potentially infected with Ebola virus SHOULD be quarantined for 21 days. I cannot find that recommendation on the WHO site. does it infect ppl without attacking them until its signal molecule reaches a threshold and thats when it shuts down all the organs?